Genre: 95% historical romance, 5% modern chick-lit. Where did it come from? The library. Summary: Grad student Eloise Kelly knows what she wants to write her thesis about: the true identity of the Pink Carnation, who, like the Scarlet Pimpernel and Purple Gentian, was a British spy in France during the Napoleonic wars, but who, unlike the other two men, has never had his identity revealed. Eloise stumbles upon a treasure trove of papers which she is told may hold the name of the Pink Carnation, but what she finds instead is a love story between Amy Balcourt, a feisty young woman who is determined to help the British cause against Napoleon, and Richard Selwick, the man who was known as the Purple Gentian. Review: This book was thoroughly, exceedingly silly, but still entirely entertaining. Let’s be honest: it’s got a lot of flaws, both in concept and execution, but at the same time, it kept my attention, kept me reading, and was a nice, light, thoroughly fluffy, funny good time. I wasn’t crazy about the framing plot, either. Chick lit is just not my genre of choice, and the framing story is thoroughly steeped in it (New rule: If you refer to an article of apparel, particularly shoes or handbags, by designer (“my Jimmy Choo boots”), then what you are writing is chick lit.) The male “romantic” “lead” in the framing story is your standard devastatingly handsome but curmudgeonly but with a soft gooey heart of gold Brit… Willig even names him “Colin”, fer god’s sake. And, while I’m okay with the framing device of a grad student pouring through old documents to introduce a historical plot, the abrupt switch from “Oh my goodness, look at these amazing papers and documents and letters and diaries and DOCUMENTS.” to an omniscient third-person narrator in the historical sections left me wondering about the context, and about how much of what we were reading was actually available to Eloise. But despite not being clear about the context of the story, and despite wanting to give Amy a good slap and tell her to stop being a moron, AND despite figuring out the identity of the Pink Carnation very, very early on, I still kept reading, and I still enjoyed the book. As long as I was able to turn off the part of my brain that makes rational objections to all of the things mentioned above, this book was funny, and entertainingly racy, and a fun adventure romp. 3.5 out of 5 stars. Recommendation: If you like historical romances, or just need something light and appropriately guilty-pleasure-ish for an airplane or vacation read, or just to give your brain a break, this one was certainly fun to read, despite (or because of?) it being thoroughly silly fluff. First Line: The Tube had broken down. Again. 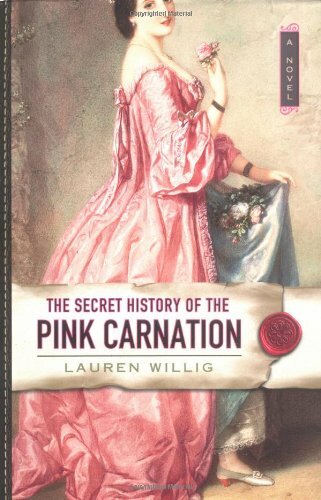 Cover Thoughts: It looks like what it is, namely, a historical romance, and it does feature a pink carnation. However, neither the title nor the cover gives any hint that it’s a book about spies, which loses it some points. p. 96: “He reached for the shawl, and Jane handed it to him graefully before sliding back against the velvet squabs.” – a thickly stuffed, soft cushion. p. 200: “Mme Rochefort’s parties teemed with young adventurers, agin flirts, and hardened roués, all barely clinging to the fringes of society.” – a dissolute and licentious man; rake. p. 327: “A shako hat rolled through the dust as Amy rammed into one of her captors, sending him reeling.” – a military cap in the form of a cylinder or truncated cone, with a visor and a plume or pompon. I often don’t care about improbable situations, but for some reason, modern-sounding dialogue in historical fiction novels drives me up the wall. Love the rule about chick lit! I think the next couple of books are somewhat better, although I’m a bit distressed by the fact there are now 5 of them. I think it is time to wrap it up already, 3 would have been enough (haven’t read the 5th one yet). I do enjoy chick lit from time to time but I’m not crazy about romance, so I don’t think this book is for me. Jen – Good to hear the sequels improve; I’ll have to put a hold on the next one at the library for the next time I need some brain candy. Meghan – I wouldn’t say I didn’t enjoy it… it did keep me reading for a full day and made me put off a bunch of errands and other responsibilities so that I could finish it. I didn’t find this book, or the rest all that romance-y, more like fiction in my mind. And I am not at all a historical fiction buff so perhaps that is why the anachronistic bits didn’t bother me as much. I do enjoy this series though. I have to say this one if my favourite of the bunch. “….despite wanting to give Amy a good slap and tell her to stop being a moron.” AND other caveats! it must’ve been an entertaining read for you to finish it. I recently read this one, and was a bit disappointed. I wasn’t expecting so much romance and wouldn’t have picked it up if I’d known. It’s not a series I’ll continue with, but I can see where it could be really appealing to others.